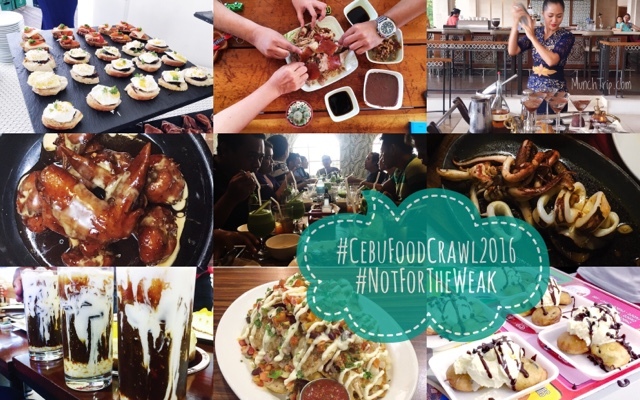 The Cebu Food Crawl 2016 experience was an overload for the senses and the soul. moments that right after everything has happened, it is making separation anxiety such a pain to handle. I never imagined I would be able to experience the premiere food destinations of Cebu in the unique ways during the event. So, expect me to be sharing my experiences thru this blog. Food Adventures will introduce you to people with similar interests from different walks of life, like the CFC2016 "crawlers". What more, I was a crawler alongside brilliant people who inspire others to be positive and be persistent in what you love to do. Each one was unique and had different levels of expertise in their respective fields. Never will I forget how blessed I am to have had this experience even though I am a neophyte food and travel blogger. It was such an honour. Some even graced me with their stories and attention despite the very crazy hectic schedule we had. Thank you for trusting me within such a short period of knowing me. You have made this munchtrip even more personal. I appreciate the realness. • realizing the meaning of "the early bird catches the worm"
• fiesting on homey food and lots of "feels"
• and lastly, knowing that everything is a journey. I had a blast! I still cannot comprehend all the “feels” I have for the most overwhelming four days of my life in Cebu, Philippines. Parting is painful but must be done. Though I would rather remember my first hellos and experiences with everyone and everything. I know I will still see you again, someday. Please, if you see me anywhere, I don’t mind if you call me “psst” because you forgot my name or even call me out “calachuchi” because that’s what you remember. Don’t hesitate. I am a friend. 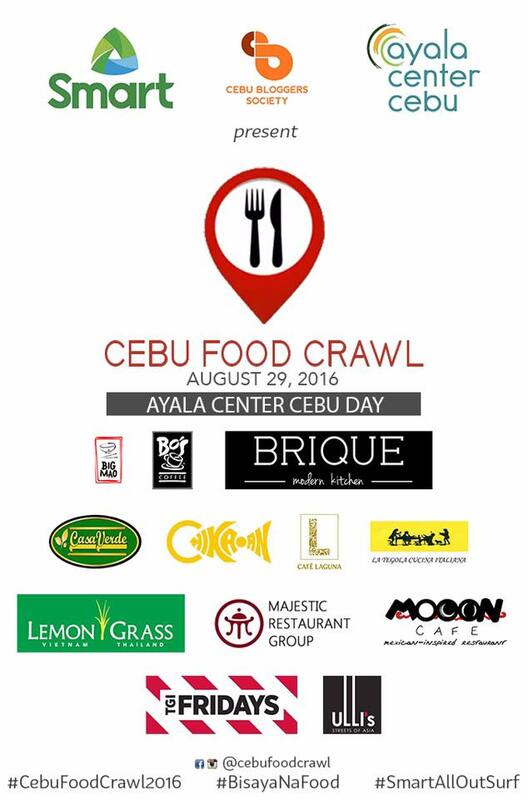 Thank you so much Sinjin, Atty Ethelbert, Hershey, Guada, Mark, and Cebu Bloggers Society for giving me the chance to be a crawler in the Cebu Food Crawl 2016. I am thankful for all you have done to make this happen. During the event, I witnessed how many individuals with varied personalities you had to handle, how well-organised you made schedules happen, how well you stayed on top of to-do tasks so the event ran smoothly. Thank you for all your sacrifices to let the participants stay safe, feel comfortable, and have fun. Thank you Smart Communications, Inc., and Ayala Center Cebu. Congratulations Cebu Food Bloggers for an awesome, “feels”-filled, successful event! You all deserve a standing ovation. 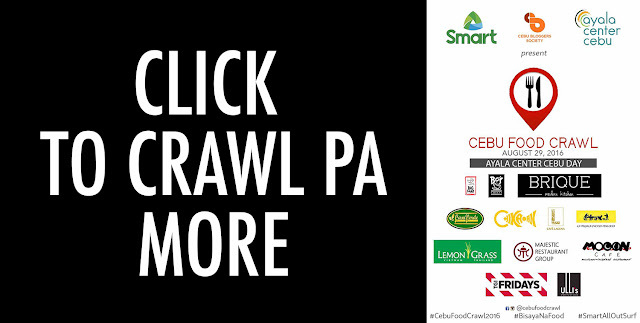 For those who want to see all the posts in social media, follow Cebu Food Crawl on Facebook or just search #CebuFoodCrawl2016 #BisayaNaFood #SmartAllOutSurf and #Zomato on Instagram, Twitter, Facebook and Tumblr. I had a blast and I am sharing it to the world in my Munch Trip accounts via #munchtrip.